If you think that grills are just for cooking big, honking cuts of meat and flipping burgers, think again! There's a whole world of grilled vegetables out there, just waiting for you. In fact, Pinterest is filled with posts for how to grill vegetables, so there's no shortage of inspiration. We've found tons of recipes for grilling vegetables like bell peppers, yellow squash, sweet potatoes, green beans, and cherry tomatoes, but it's often helpful to start with a few basics before you dive in. Luckily, Executive Chef Stephen Bonin of Geraldine's in Austin, Texas is here to share his top tips and tricks for how to grill vegetables like a professional. Chef Bonin isn't about just following grilling recipes: he's about focusing on seasonal and regional flavors. 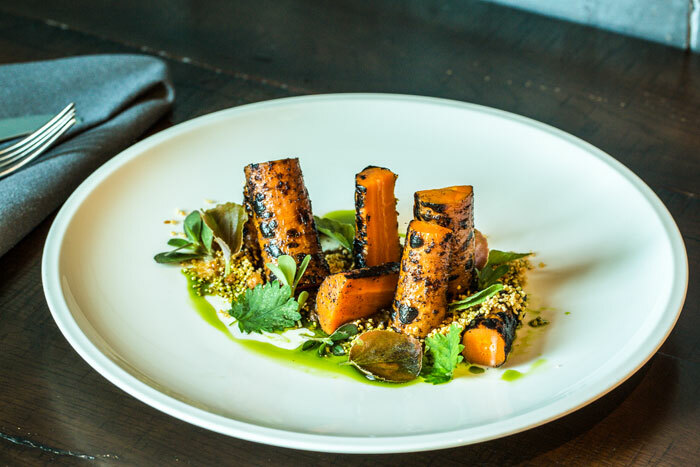 He's not only responsible for an ever-changing menu at the Hotel Van Zandt's on-site restaurant, but his cuisine always showcases whatever's fresh at the moment. He mastered the fine art of grilling veggies after working in well-respected Austin restaurants and he's ready to share his knowledge and experience with you! Coupled with his Texas roots and his reverence for the latest and greatest trends, we think you'll love Chef Bonin's tips and tricks. If you're looking for some credibility, just pop into Geraldine's and try the crowd-favorite dish: The Smoked Carrots. One bite of those deliciously smoky, grilled carrots and you'll be ready to follow his lead to make dishes like that at home! Your choice in wood absolutely matters, especially when it comes to the delicate flavors of vegetables. Chef Bonin likes to find 9-12 month aged wood before throwing it on the grill. Aged wood burns much better than new wood because the water in the bark has dried out. When it comes to wood type, Chef Bonin also has a preference. "I like to use oak wood for the flavor," he says. It also doesn't hurt that oak burns super hot, so if you're looking for high heat and quick fired vegetables, oak is definitely the way to go. For a comprehensive look at all the types of wood and the flavors they can impart into your food, check out our comprehensive guide to every type of wood to use for smoking meat. 2. Don't play with fire. There's a difference between grilled flavor and burnt flavor, so make sure you're not playing around when it comes to fire! Chef Bonin recommends keeping your fire under control so the flames don't come into direct contact with the food you're grilling. This would char the food, which can take away from the overall flavor. For some vegetables, this might mean putting them in a heavy-duty foil pouch or on a grill pan. This would protect the vegetables from the flames. Don't worry about the vegetables getting plenty of grilled flavor - even in a pan, they'll have access to all that great smokey flavor produced by the charcoal or wood chunks. 3. It's all about the placement. Every grill has its own unique "hot spot." This is the spot on the grill that seems to burn hotter than any other spot, no matter what you do. Don't know where your hot spots are? No worries, you can find it with the "Toast Test!" Cover your grill with a few slices of bread and turn the burners on high. Run the grill for a few minutes before turning over those pieces of bread. The ones with areas that have toasted more are in the hot zone. Finding the right spot on your hot grill is a great way to cook your vegetables quickly, making tender vegetables perfect every time. You don't want them to get mushy or overcooked, so make sure you're cooking with heat! And if you've had enough of the vegetable grilling tips, check out our favorite chicken recipes, like this one for Grilled Chicken with Balsamic and Dijon marinade. It'll make a perfect accompaniment for those perfectly grilled vegetables now that you know how to make them!